Darko takes us downtown to this beautiful area. Tons of Monuments centered around Alexander the Great fountain. 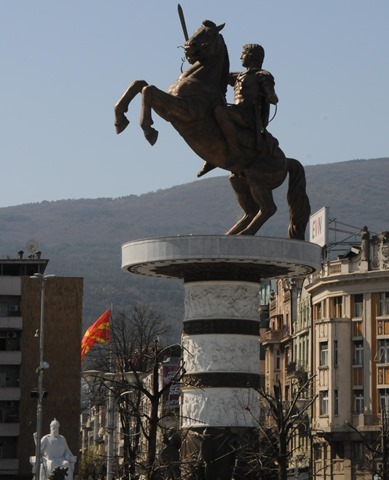 You may not be aware, but the name itself “Macedonia” is controversial. Greece doesn’t like that Macedonia or FYROM (the Former Yugoslav Republic of Macedonia) uses that name. In Greece, the region north around Thessaloniki, is known as Macedonia and recognized by them as the *real* Macedonia. I highly recommend a quick read from Wikipedia’s article on the Macedonia name dispute. For now, don’t get upset if I don’t use the ugly acronym. I love both ideas, and I’m sure they’ll work it out eventually. 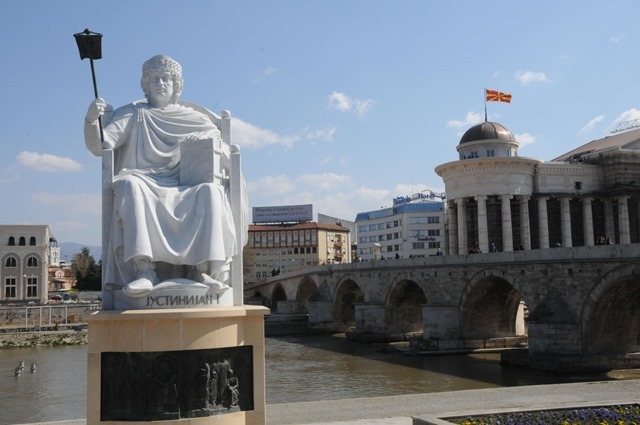 Maybe if Skopje builds more monuments of Alexander the great, Greece will concede… joking!! The amount of construction going on, on these massive and incredible monuments would make you think there’s a great insurgence of money coming in, but really it seems something imperial is going on. There is a new Caesar or Alex in town. Pictured Below: Tsar, and the Stone Bridge originally from 6th century, and that’s not Las Vegas’s Caesar’s palace but it sure looks like it. 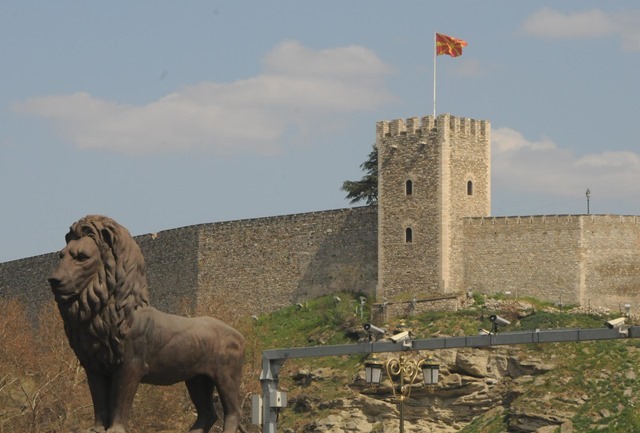 Right from downtown if you look up, you see this amazing castle -Kale Fortress built by Byzantine Emperor Justinian. It adds a very chivalrous spirit to the air, and the amazing river and big statues everywhere and all the great colorful flags made for a beautiful day. I thoroughly enjoyed the city, and walking around it was a lot of fun. I am a bit dissapointed I didn’t spend more time in the old city going to the bizarre. I’ve heard lots of good things online. As a tourist, you could spend most of your time in this area of the city walking up the hill… incredible views. We even found a secret door into the fortress. Very interesting. In these streets of the old bizarre and double hamam you could get lost in a good way weaving around old and new. We had some great hot chocolate the the guys LOVED the coffee. The new Mother Theresa building is very nice as well. More great statue and modern art. Darko then took us to a fabulous lunch. After another incredible meal. Awesome vegetables, and succulent meats, we simply walked upstairs to a large group of people that were actually waiting for us. Darko organized a technical event for me and my traveling buddies to present at. We had over 120 attendees and with Darko’s help we launched a brand new SharePoint community in Macedonia. We were super pleased with the turnout. Nothing I love more than to feel like I’ve left something behind that will blossom and grow. Building community provides infrastructure, support, and strength. It also grows friendships and global connections. After the event we went back and I was doing some research. I wanted to make sure we didn’t miss anything super cool. I came across Roman Aqueducts just outside the city, and then was reading about the largest Roma community of 30,000 being nearby. Michael had this funny look on his face. Dude, I’m surprised your not excited. What? Gypsies! OH, NO WAY! I’ve always wondered where gypsies came from. Here I had found the beginning to that answer. No where in the world is there a community quite like this. We did a little research, and Paul being skeptical about our little on the fly adventure to a city of gypsies had him emptying his pockets taking off his watch. I wasn’t as worried, but what did I know. I had no idea what to expect. I did expect desperation. I had read about 70-80% unemployment. Wow. So sad. I read about efforts to build homes, build schools, but what an incredible story. I should have been alerted to why it was cool when I read… “this is not a tourist attraction.” That is a good clue. After quickly getting ready we jumped in a cab, and said Shutka… huh? Roma… ah!? Why!? We want to see the people! I wasn’t sure what our cabbie could have been thinking. He later explained to us that we were the first tourists he’s taken to that part of town. While there is a textile market, and exchange that locals would request to be taken to, we were the first of his customers to purposely go into what he’d consider a strange part of town that most would avoid. That is often the way we travel. I find I personally am fascinated by where culture shows its both clean and ugly head. I really don’t only want to see the sugar coated places. My friend Ricardo our guide in San Jose Costa Rica, Buenos Aires, Santiago and Uruguay was always looking out for us, so we had to purposely get ourselves into situations where we could find where the “real” people lived. For me this one late afternoon was one of the highlights of the trip for me. Here I was seeing tons of kids roaming the streets that were extremely inquisitive. I saw a guy selling used shampoo bottles. We saw homes where animals lived better than the humans, and visa versa. There were lots of horses, and dogs. Walking the streets we ran into Jehovah’s Witnesses. From my past experience as a missionary of the LDS Church, we called them JW’s (Jay Dubbs.) They were dressed nicely and were teaching a couple of different women. I have to tip my hat to them. While others saw this as a dangerous impoverished area, they were trying to spread the gospel of hope. I don’t know how well it was being received, but based on an earlier conversation on the trip where we were talking about conflict and religion. It was nice to be able to share how religion can bring hope to a soul. The conflicts in Kosovo for example while on the surface it looks like religion, I still do have to see these as national conflicts, pursuits of freedom, and of nationality. The Balkans are so rich with so many nationalities, and religion does play into those differences. 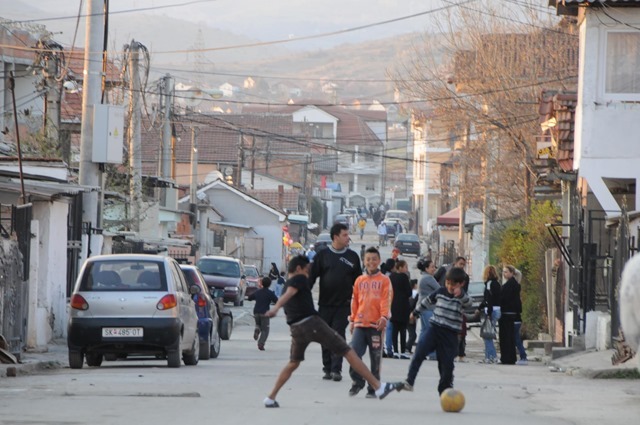 If peace can be found in the Balkans it will spread across many lands. The conquests of the Persians, Greeks, Roman empire, the Byzantine empire, the Ottoman empire, and Hungarian, and Hapsburgs… This was the burnt over district. There’s a lot of history in this little area. Spain has good examples of how it can work in the same nation. France is still working it out… and when we do get things all worked out it will be for the betterment of society as a whole. One question the roaming gypsy seems to bring up is… where do they come from? Assumptions are they come from Northern India. One more recent thought is they come from Egypt. (hence the name E-Gypt becomes Gypsy.) Having visited both of those areas. I do think the beautiful eyes of the Rajasthan province of India would be a good match, but at the same time, there are a lot of similarities with Egyptians and both are plausible. Would be interesting to get some DNA family research. Some DNA has been done which points to Pakistan and Northern India. The unique cultures of the Roma people are fascinating. I would love to spend more time understanding it. Would love to help build a school, and help inspire the families to value education. It was amazing to see how much they value family and family unity. 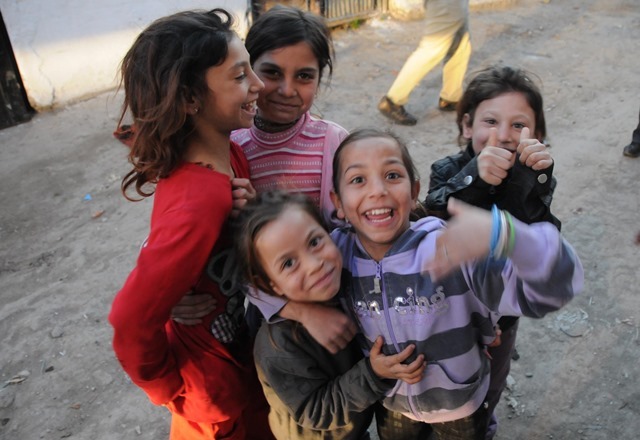 To be rejected from the Roma society is one of the worst things that can happen to someone. The Romani people have a journey ahead of them. As a people they have suffered slavery, they were shot on site in WWII by the Nazis, post WWII their music was banned, their women were sterilized, and in eastern Europe haven’t had a fair shake. Do they assimilate? Do they stop wandering and build cities like Shutka? No matter where they are they will receive persecution despite the fact that they tend to accept the religion of the region where they live. 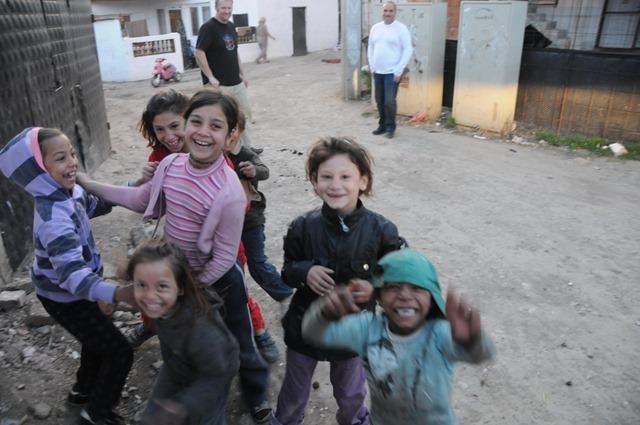 Very recently there are still problems around the world with the Romani people. Paul did quite a bit of research after we got back… I think something happened to him in that city. It definitely did to me as well. I think I’m going to look out more for ways I can help people when I travel… I hope you will too!